Owens attended The Ohio State University only after employment was found for his father, ensuring the family could be supported. Affectionately known as the "Buckeye Bullet," Owens won a record eight individual NCAA championships, four each in 1935 and 1936. (The record of four gold medals at the NCAA has been equaled only by Xavier Carter in 2006, although his many titles also included relay medals.) 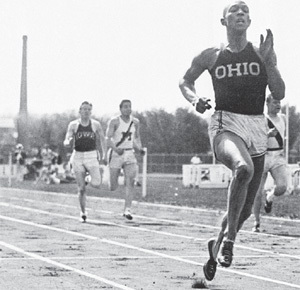 Though Owens was enjoying athletic success, he had to live off campus with other African-American athletes. When he traveled with the team, Owens could either order carry-out or eat at "black-only" restaurants. Likewise, he slept in "black-only" hotels. Owens was never awarded a scholarship for his efforts, so he continued to work part-time jobs to pay for school. 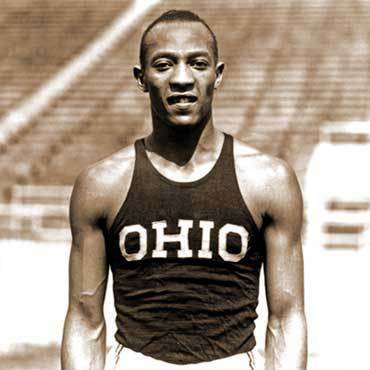 Owens's greatest achievement came in a span of 45 minutes on May 25, 1935 at the Big Ten meet in Ann Arbor, Michigan, where he set three world records and tied a fourth. He equaled the world record for the 100-yard (91 m) sprint (9.4 seconds) and set world records in the long jump (26 feet 8¼ inches (8.13 m), a world record that would last 25 years), 220-yard (201.2 m) sprint (20.7 seconds), and 220-yard (201.2m) low hurdles (22.6 seconds to become the first person to break 23 seconds). In 2005, both NBC sports announcer Bob Costas and University of Central Florida professor of sports history Richard C. Crepeau chose this as the most impressive athletic achievement since 1850. Jesse gave the world a preview of things to come in Berlin, while at the Big Ten Championships in Ann Arbor on May 25, 1935, he set three world records and tied a fourth, all in a span of about 45 minutes. Jesse was uncertain as to whether he would be able to participate at all, as he was suffering from a sore back as a result from a fall down a flight of stairs. He convinced his coach to allow him to run the 100-yard dash as a test for his back, and amazingly Jesse recorded an official time of 9.4 seconds, once again tying the world record. Despite the pain, he then went on to participate in three other events, setting a world record in each event. In a span of 45 minutes, Jesse accomplished what many experts still feel is the greatest athletic feat in history...setting 3 world records and tying a fourth in four grueling track and field events. It was this versatility which on May 25, 1935 electrified the sports world as it hadn't been in decades. The setting: the Western Conference Outdoor Track and Field meet at Ann Arbor, Mich., and the expectation that the Ohio State sophomore sensation would give them something to remember had brought out the largest crowd yet to see a Big Ten meet - more than 10,000 people, packed into Michigan's ancient Ferry Field wooden stands. For three weeks Jesse had had an aching back which hadn't responded too well to treatment. Therefore, it must have been pure adrenalin which, in the space of 45 minutes, took his mind off his ache and enabled him to put on the greatest one-man, one-day performance the sport had ever known. Jesse broke three world records and tied a fourth. At 3:15 he flashed down the track to win the 100-yard dash in 9.4 seconds, tying the world mark. At 3:25 Jesse removed his sweat suit, bent over at the top of the broad jump runway and hurtled forward toward the take-off board. In his first and what was to be his only jump of the day he rocketed out 26 feet 8 ¼ inches, breaking the world record by more than half a foot. At 3:34, just nine minutes later, Owens again slipped out of his sweats, this time for the 220-yard dash. He took his mark, went to the set position, was off with the gun and streaked home almost 15 yards ahead of the second man in 20.3 seconds, slashing three-tenths of a second from the world mark. At exactly 4:00 p.m., 16 minutes later, he again took off his sweats and eyed the long row of barriers placed in position for the 220-yard low hurdles. Again the gun, and again there was Owens ripping away from the field, flying over the timbers to the tape. The time: 22.6 seconds, four-tenths of a second shaved from the world record. The 5-10, 165-pound paragon of poetry in motion was to add verse upon verse to his accomplishments. A few weeks after the Conference meet, he scored an unprecedented sweep of the same four events in the National Collegiates. He swept the same four at the Conference meet the following May, 1936. Then he repeated his NCAA triumphs in June, 1936. Eight Big Ten outdoor crowns; eight NCAA crowns. The figures stand alone in track history. He never got the chance to add the senior year championships which surely would have made his figures as permanent as those at Mt. Rushmore. The 1936 Olympic Games altered his whole life. From the moment the American contingent arrived in Berlin the so-called Buckeye Bullet was the man most marked for distinction. The 110,000 who jammed Adolf Hitler's new stadium, and fans at home throughout the world, wondered whether Owens would be vulnerable to the pressure of international competition and show a crack in his invincibility. At no Olympiad, past or future, would an athlete be subjected to such searching scrutiny. Correspondents converged in platoons around Owens in the Olympic Village where the athletes were quartered, prying into his minute-by-minute activities in Berlin. Some European papers and magazines even sent female writers in an attempt to whip up a special perspective. Finally, the American coaching staff had to blow the whistle on the intensive coverage. There was just too much danger that Jesse would be badgered into a state of nerves. They needn't have bothered. Larry Snyder, Owen's coach and assistant coach of the Olympic team, could have pointed to Jesse's amazing ability to hang loose. Relaxation, in fact, was the key to his performing style. He didn't know what it was to be tense either before or during competition and his flawless style reflected it.